I took this photo a few days ago on a rural road riding back towards Assen. It's an example of a fairly typical Dutch country road. No middle line, but just a narrowed black area of tarmac, with what appear to be red "cycle lanes" either side. Except that these are not really cycle-lanes. The idea here is to optically narrow the road to make it uninviting to drivers. Drivers have to drive in these lanes in order to pass one another. They also use the entire width of the road (i.e. the red part on the other side) to pass cyclists. Avoiding painting in a middle line also makes the road look narrower and helps to reduce speeds. Centre line removed on road next to cycle-path. Note that the road in the top photo is empty of cars. That is the normal state and the result of a deliberate policy to unravel cycling routes from driving routes which extends right across the country and along country roads as well as within cities. Where there is a higher level of use by motor vehicles, a segregated path is required, but the road can still look identical. The removal of centre-lines still takes place as that is part of the treatment of country roads with 60 km/h speed limits. So how have motor vehicles been removed ? Well, of course there is more to this than initially meets the eye. The low usage by motorists and low speeds are not the only thing that is special about this road so far as cyclists are concerned. There is also the fact that the road signs actually suggest using different roads depending on whether you are cycling or driving. The sign illustrates this. Only two destinations for drivers are shown, four for cyclists, and the same destinations for cyclists use different roads than those for drivers. This is a form of traffic mode segregation without separate cycle paths. Cycling in the countryside is more attractive in The Netherlands than most other countries precisely because options for drivers are limited and interactions between cars and bikes are reduced in frequency. I covered some more extreme examples of rural traffic calming previously. This bike path has recently been resurfaced in Assen. It was slightly narrow but is now a generous width, about four metres. The path is alongside the road through an industrial estate and it is heavily used by many students and adult commuters to get to schools and workplaces near the city centre from a suburb on the other side of this industrial estate (though clearly less heavily used at the time when I took this photo). The main reason for this photo was to illustrate the style of lamp-post used. Not only is there a lamp for the road, but there is also one for the cycle path. This is to ensure that this path, like others, has adequate social safety so that cyclists are not put off using it just because it is dark. Note also the usual high level of subjective safety due to being separated from the cars. These are the things that make for a high cycling rate. An industrial estate is never going to be the best place in the world to cycle, but the attention to details makes the best of a bad situation. Yesterday evening's ride home from work was a bit of a trial. Headwind the whole way again. It may be (very nearly) flat here, but flatness means nothing to get in the way of the wind, and headwinds are much worse than the odd hill. They're like an eternal uphill - you don't get to go down the other side. On the way I came across this family on the way home from somewhere. They have three children. Dad was giving the youngest child on his own wheels a bit of help while Mum had the very youngest on a seat in front of her on her bike. I've not idea how much of the 30 km from Groningen to Assen they were riding, but they felt safe because the cars were on the left of the trees. Maastricht is a city in the south-eastern, and quite hilly, Dutch province of Limburg. The Fietsberaad reports that Maastricht now has a new and ambitious cycling plan. The article is quite interesting. In the city currently, 30% of all journeys up to 7.5 km ( 5 miles ) are by bike, which is now considered to be a low figure by comparison with other Dutch cities. The aim is that by 2011, the rate of cycling will have increased by 10% beyond the rate in 2006. In order to help make this happen, four million Euros are being spent in the next two years. Maastricht's population is 117000, so that's around 17 Euros per person per year. There are eight main ways in which the change is to the made. There is to be a reduction in barriers on the main cycle route network. Further separation of the networks for cars, public transport and cycling. Improvement in comfort and safety of important routes. Improvement in permeability for cyclists of and between different areas. Improvement of quality of the facilities. Quantity and accessibility of cycle parking facilities and parks. Expansion of availability of hire and loan bikes. Improvements for recreational cycle usage. The plan has come about on the basis of conclusions from the Fietsbalans ( a standardized way in which Dutch cities evaluate how they are doing ), various evaluations, results from traffic surveys, discussion with involved organisations, feedback from exhibitions and reactions sent by citizens. In November 2007, citizens were given took the opportunity to react online. 800 placed messages about problems on an interactive map, all of which have now been dealt with. Video courtesy of Mark Wagenbuur. The Drents Fietsvierdaagse was last week. This is a four day recreational cycle ride which has been run every year for forty years. There are several start places, including here in Assen. This year there were 13000 participants. 11000 of them rode every day, and the others were people who joined in for a day or two. There are several rides each day, all recreational rather than races (there are plenty of other events for those who want to race), and this video from our local broadcaster focusses mainly on people doing the "RollOnRoute" ride aimed mainly at people with disabilities and their family and friends. Cycling is very much an inclusive activity. The routes go through a lot of villages, and of course all the cafes on route do great business. Lots of places open especially, and there are stalls selling all kinds of things. We took part last year and enjoyed it a lot, but I was working this year and sadly couldn't spare the time. You'll see a nice wide demographic in the video. Men and women of all ages, able bodied and people with disabilities, out there having fun. Sadly the event was marred by quite bad weather this year, but this didn't seem to dampen too many people's enthusiasm. In the last two weeks I've covered our other two bicycle trailers, the BOB Yak and the Carry Freedom City. Now it's the turn of our largest trailer. ...made a basket on a plywood base to go on top. So it stayed until very recently, despite the constant aggravation caused by the inadequately designed hitch mechanism, which tried to clamp onto one of the chain tubes, but would often become loose. Luckily, such clamp type hitches can be replaced. I used the Chariot hitch. It's very easy to replace most hitches. In this case I needed an allen key and a spanner to remove the old hitch. The same allen key, spanner, nut and bolt now hold the new hitch. Note that as the "lollipop" was a bit thinner than what came off the trailer, I also needed a bit of shimming here. I found that a slide of narrow inner tube exactly filled the gap in the case of my trailer and hitch, and as the lollipop itself is flexible this is probably rigid enough. You connect the trailer by sliding the ball into the cast hitch which is attached permanently to the bike by the wheel nut or quick release. Then you push through the pin and it's held securely by a rubber part. The customer inspects my work... We then went for a test ride, and another walk in the woods. The trailer is much more usable with a decent hitch mechanism. We sell some solutions for carrying dogs by bicycle. There's also a video of a previous adventure with Harry by bike. I took this photo on the 9th of September 2001. 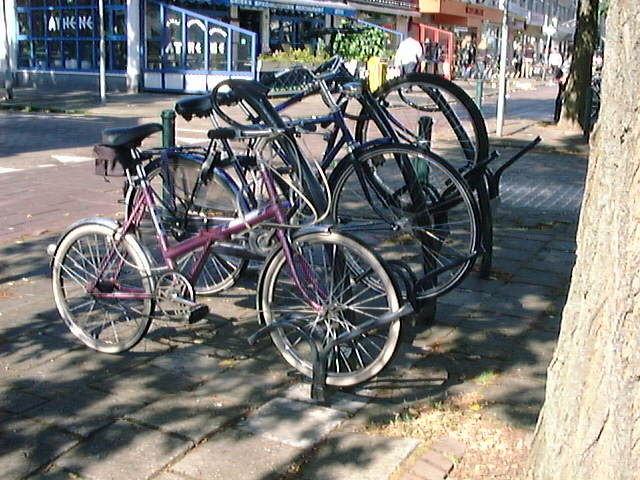 It was the first time I had seen the tulip style cycle stand, which I've since come to realise not only looks elegant, but also is one of the most effective types of cycle parking available. In this instance such a stand is supporting a mountain bike with fat 26" tyres, a traditional Dutch bike with 28" wheels and a 20" wheel folding bike. The stands hold your bike upright while you load shopping, grip enough of the wheel not to be "wheel benders", provide a loop through which the frame can be looked and due to being on two levels they permit bikes to be parked close together without clashing so that large numbers of bikes can be parked in any given area - an essential thing here where there are often thousands of bikes parked in one place. So, why do I prefer these to the "Sheffield stand" or "U-rack" now almost universally recommended in English speaking countries ? Capacity is a large part of the reason. These stands support a lot more bikes in the same area, and when you get used to your bike being held upright for you as you load cargo, the idea of leaning it vaguely against a Sheffield stand seems very second rate. With these stands, both sides are free so you can load a pannier on both sides without having to reposition your bike. 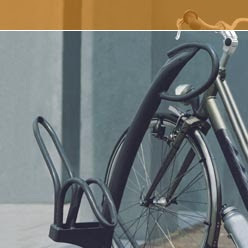 Because of the way they grip the front wheel your bike doesn't try to roll forwards or backwards when parked. Sheffield stands also generally look rather less tidy (this used to be a link to an unsightly pile of bikes in Cambridge, but sadly that cycle-stand has been removed). 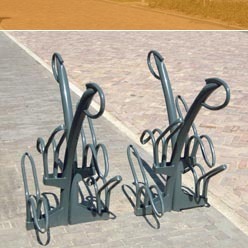 The Tulip stands are made by Velopa. You can see examples of them in use on their website. There are more cycle parking posts. The 200000th new cycle parking stand built at a Dutch railway station since 1999 was also a tulip stand.